There are many Puzzles and Sudoku Events going around the world. 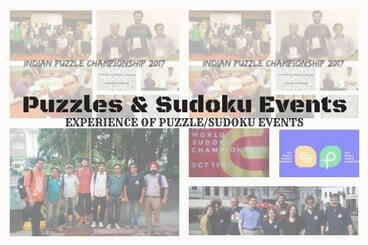 Many different people has written about their experience of attending these Puzzles and Sudoku Events. In this post we capture all these writing and put links to these post where one can read their experience in these championships. I am posting these event in reverse chronological order starting from the latest events to earlier event. Bangalore Puzzle Meet August 2016: Rajesh Kumar's experience in attending August 2016 Puzzle Meeting in Bangalore. The Science And Fun Learning Camp 2016: Checkout photographs of kids enjoying Sudoku and Puzzles solving sessions during "The Science And Fun Learning Camp 2016". My Experience @ Sudoku Mahabharat 2015 Finals--Read about Rajesh Kumar's experience participating in Sudoku Mahabharat 2015 Finals. 2nd Puzzle Meet Up @ Bangalore 14th June, 2015: This is experience of Rajesh Kumar attending 2nd Puzzle Meet in Bangalore in June 2015. Puzzle Meet Up @ Bangalore on 31st May, 2015: Puzzles and Sudoku solvers in Bangalore started meeting in Bangalore regularly starting year 2015. This is Rajesh Kumar's experience in attending first Puzzle Meeting in Bangalore. Kids solving Sudoku and Puzzles : Cute Children solving puzzles and Sudoku During "Science And Fun Learning Camp" in year 2014. Article on 'Toughest Sudoku' in Mirror Newspaper: Read about Multiple Time Indian National Sudoku and Puzzle Champion Rohan Rao's experience solving "Toughest Sudoku of year 2010"